Harry Winston, the diamond retailer that holds a 40% stake in Rio Tinto’s Diavik mine in Northern Canada, is in talks with BHP Billiton to buy the Ekati operation, also in the north of Canada. Both Rio Tinto and BHP are trying to get out of the diamond business as they can’t realize the scale in the industry to make it a core business. Titan, part of the Tata group, is rumoured to be interested in an acquisition of Harry Winston and might emerge as a competitor in the consolidation movement in the diamond business with strong financial backing. Xstrata’s operating profit for the first half year dropped by 42%. Approx. half of the drop is attributed to lower commodity prices, the other half mainly to inflation and lower volumes. An important message communicated in Xstrata’s earnings presentation is the potential of the company to continue stand-alone in case the share acquisition by Glencore (supported by Xstrata management) fails. Xstrata’s shareholders get to vote on the deal on September 7th. Rio Tinto’s operating profit for the first half year dropped by 22%, mainly driven by lower iron ore prices and higher costs caused by lower grades and higher stripping ratios. Xstrata is among the few companies that manages to communicate (or achieve) a unit cost reduction in its earnings presentation, probably the largest driver of positive reception of the quarterly numbers by the investment community. By breaking out the ‘uncontrollable’ inflation part the company communicates it has success in cost cutting, even though nominal costs increased year on year. Most large miners are stressing the discipline of their capital investments in the latest presentations they are giving, promising only to invest if a good return can be achieved. The most prominent example of a potential cutback on capital expenditure is BHP’s announcement that it is reviewing the expansion of the outer harbour in Western Australia required to lift iron ore export capacity to the planned level. While trying hard to show the investments are responsible, the companies also try to communicate that ‘the industry fundamentals’ are still solid, mainly using the projected long-term growth of China as explanation. However, Rio Tinto’s updated demand forecast graphs are among the first that show a negative Chinese trend after 2030 (in line with the model presented on this site). Knowing that a large part of current big projects in iron ore and coal are planned to build capacity for more than 20 years these long-term prospects slowly start to make their way into investment decision-making. “Rio Tinto’s iron-ore-driven profits set company records for the interim period but shares fell for a fourth day as investors’ flight from equities hits resources stocks hardest. Total increase of earnings because of price increases ($5bln) was offset by almost $3bln lower earnings because of volumes, costs and exchange rates. Just as Anglo American, the company gives a detailed explanation of the rising costs, providing rare details on the waiting times for various types of equipment (see outlook – page 8). The outlook shows the average delivery time for equipment currently is approx. 6-9 months higher than average. The impact of lost volumes because of weather impact (hurricanes & floods) in the first half of the year, often mentioned as important driver of prices, is only $245mln. Rio Tinto does not appear to be concerned with the current importance of iron ore as the driver of earnings. The company regards construction industry growth in China the most important metric for the economic outlook and mentions expansion of production capacity of Western Australian iron ore mines as key development priority. The company joins competitor Vale in this single-minded focus, while BHP Billiton appears to be more committed to diversify, as signalled by its acquisitions in the shale gas industry. The presented $26bln capex package does not yet include projects in advanced feasibility stage such as Simandou (iron ore in Guinea). The relatively conservative dividend and buy-back program does leave room for very aggressive development spending and helps the company to keep a very low gearing. So far all major miners choose to keep the gearing low despite their positive commodities market forecasts. “Escondida, the world’s largest copper mine, declined the Chilean government’s offer of mediation in its labor conflict, Valor Futuro reported Tuesday, citing a company document. The sole union at the mine, representing 2,375 workers, went on strike late Thursday to protest what it says are unmet labor-contract terms. 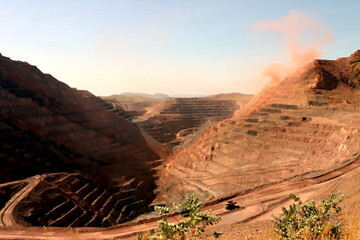 Escondida (translated: ‘hidden’) is majority owned and operated by BHP Billiton. Unions demand higher bonuses, unmet housing benefits, the elimination of shifts lasting more than 12 hours, and protection for sick workers. Daily lost output could add up to 3,000 tons. The company plays tough by refusing to continue negotiations as long as the strikes continue. The wave of new labor contracts reached for various copper mines in Chile through collective bargaining has gone relatively smooth so far. Leaders of Codelco have expressed fear that the conflict at Escondida could spread to other companies. High commodity prices and increased resource nationalism have led to a surge in mine operation strikes in the last months: BHP’s Australian coal operations, South African coal mines, and Escondida being the most well-known. Companies try to maximize output and make record profits while prices are high, and in turn workers demand a larger part of this profit then originally agreed upon. “BHP Billiton Ltd. has paved the way for another year of strong earnings after record production of several commodities including iron ore, although output of metallurgical coal, which is also used to produce steel, continues to be held sharply back by earlier flooding in northeastern Australia. BHP said Wednesday it achieved an 11th consecutive production record for iron ore, with output up 8% in the year through June 30 at 134.4 million metric tons and 14% higher than a year before in the final quarter. The company shipped ore from its operations in Western Australia state at an annualized rate of 155 million tons a year in the fiscal fourth quarter, it said. Credit Suisse expects full year net profit of $23bln for the company. Consensus revenue estimate is around $73bln. This would lift profit margin above 30%; even high than pre-crisis records. Last year’s production disruptions caused by weather were very severe, but still the large miners manage to achieve record profits. Though double digit year-on-year growth of production for key products is impressive, it will be very hard to retain this growth rate. The miners are certainly not short of cash, but are running out of the large, low cost, development opportunities they are aiming for. The tone of voice of headlines for news on the production reports of BHP and Rio Tinto is striking. While number presented above show that overall results are very similar, the focus of headlines for BHP is on ‘robustness and higher iron ore output’, while Rio Tinto’s results are welcomed as ‘output declines’.